Poetry readings abound in the south-central PA area. If you look at our calendar you can see that the open-mic poetry reading is the most common type of literary happening. 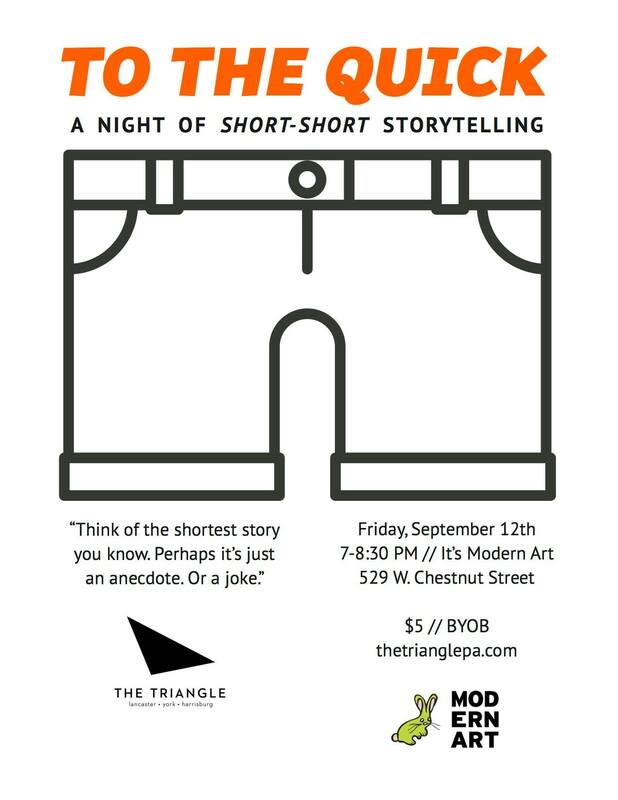 On Friday, September 12th, The Triangle teamed up with the weirdo-chic It’s Modern Art to try something a little different. The event, To The Quick!, was a night of short-short storytelling. There was no featured reader, just an hour of volunteer readers who delivered fiction stories under 1000 words. The genre, known as flash fiction, highlights brevity, power, and punch. These types of stories aim to push the boundaries of “doing more with less”. The fifty people in attendance were fed stories filled with characters who eat lipstick, animal-sounds from the center of the earth, a baby carried to the site of a shooting, Robert J. Oppenheimer, and much more. The stories were as strangely beautiful as the studio they were being told in. As diverse as they were, the stories had, at least, concision in common. Check out the video for a look at what It’s Modern Art looks like full of writers and listeners on a sunny, late-summer night. Thanks to everyone involved with the reading, especially the wonderful people at It’s Modern Art. SHAREWho Reads Short-Shorts? Lancaster Does.